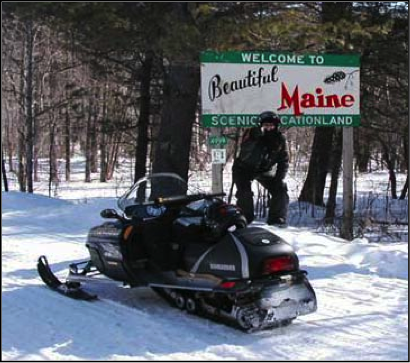 Most of the thousands of miles of snowmobile trails located throughout Maine are on private land and are maintained by local clubs. Cooperative agreements between private landowners, Snowmobile clubs, and the Bureau's Snowmobile Program are key to the success of the trail system. It is important to note that without the use of private land, most trails wouldn't exist and your ability to ride is a privilege that is granted to you by the landowner. Please respect their wishes and their land as if it were your own. To Maine Snowmobile Trails page. Snowmobile Trail Fund Sticker - available now at IF&W online store.